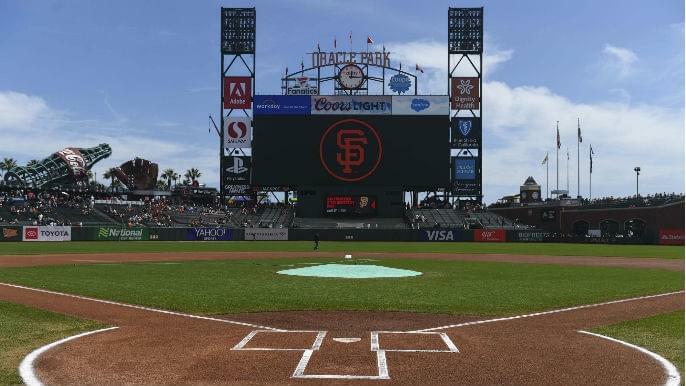 The Giants, from Farhan Zaidi to Bruce Bochy, are considering modifying the dimensions in Oracle Park, according to a recent report from The Athletic‘s Andrew Baggarly and Eno Sarris. Yes, the idiosyncratic features of the bayside ballpark could be no longer at some point in the future. That includes Triples Alley, whose 421-foot right-center-field dimension has routinely swallowed up deep shots that would result in home runs in most ballparks. This has seemingly been a longstanding idea that never really manifested into a serious conversation until this year’s spring training, according to The Athletic. In today’s MLB, where launch angle and home runs are emphasized more than ever, shortening center field could add some excitement to the game. The change could help fill more seats in Oracle Park, which has been a struggle throughout the current season. Moving the bullpens could also eliminate injury — outfielder Mac Williamson suffered a concussion after taking a head-first dive against the third base-side wall, around where the bullpen area resides, last season. Do not expect the bricks to come tumbling down next week. Any change the Giants make to the dimensions, major or minor, would receive a full workup from their analytics team, an architectural study or three and input from all levels of the organization. This topic, of course, will be met with love and hate. Modern-day fans may welcome the change, considering shortening the fences would create an uptick in homers and yield more interest for a sport that needs it. Longtime Giants fans may not. They will point to the park’s dimensions as a defining part of the team’s string of three World Series championships in five years earlier this decade. For now, the dimensions will remain, but they have become relic features of ballparks from past generations, as the team’s brass has now acknowledged.